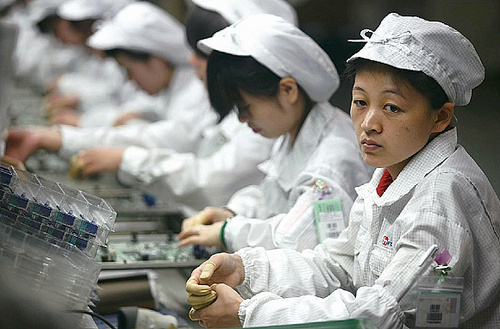 As CultofMac Explains, Working in a Chinese factory doesn’t pay well. So you can’t afford to buy an iPhone, even if you make 5,000 of them a day, the next best thing is to buy a fake iPhone. And when you can’t afford a fake iPhone, people in China just pay for a cheap service that makes their friends think they have an iPhone by adding a “Sent From My iPhone” signature at the end of their texts. They pay $1/month for this service or 6.29758614 Chinese yuan. The iPhone is too expensive. If you don’t want to spend that money, then fake it!” says the advert of one Shanghai-based vendor. Most people in china using this service are younger, less affluent and less educated consumers, so it’s not a surprise that many of them can’t afford to buy an iPhone. To get the fake signature software running, users must give merchants their username and password for the hack to work. This raises many questions and concerns about what happens to that personal information and whether or not the merchants will use the account information for other purposes. I feel bad for the Chinese workers who just want to be able afford to purchase one of the “magical” devices they help make. But spending an extra dollar every month for a service you can do yourself is not going to help you get closer to owning an iPhone. greets, from Hidden Hills, California I want to tell you, I like this article. However, it is strange how I ended up on your blog. I searched for limo rental lafayette la on Yahoo and ended up on your website. I must say I do like your site and will check back soon. But I need to find the limo I was originally looking for first. Have a wonderful day! Bye.